Wouldn’t you do more healthy cooking at home—if you only had the time? It can be tough to put dinner on the table without falling back on packaged, processed foods. But for Melissa King, watching her two young daughters struggle with health issues was tougher. She switched her family to a whole foods, plant-based diet—and it made all the difference. Plus, ENTERTAIN with White Bean & Zucchini Burgers, MAKE IT YUMMY with wholesome condiments like Hidden Veggies Tomato Sauce, and hydrate for health with PICK-ME-UPS like Beet, Orange & Ginger Juice or a Tropical Green Smoothie. You do have time to cook whole, vegan food at home—once a week, or all the time. It’s easy! 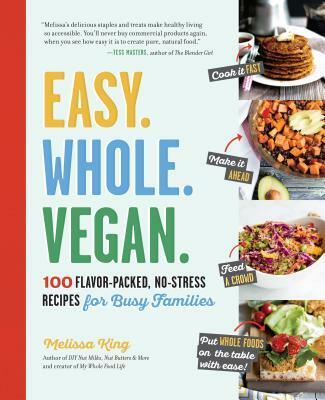 Melissa King is the writer and photographer of her popular blog, My Whole Food Life, and her first book, DIY Nut Milks, Nut Butters & More. A vegetarian for 16 years, she went vegan and quit processed foods in 2012. She lives with her family in Dallas, Texas.